The following was delivered by Alistair McConnachie on Wednesday 13 March 2013 at 7.30pm, at a seminar entitled “Ethical Finance – Understanding the Money System and its Consequences”, at the Boyd Orr Building, University Avenue, Glasgow University, G12 8QQ. The event was part of Islam Awareness Week 11-17 March. The speakers were Omar Shaikh, Islamic Finance Council Executive Board Member, who explained Islamic Banking in the UK, and Alistair McConnachie, who spoke on behalf of the James Gibb Stuart Trust. Thanks to PositiveMoney.org for the 3 illustrations below. Ladies and gentlemen, thank you for coming along tonight. And thank you to the Organisers of this event, for inviting me to speak. It is a privilege for the charity which I represent, the James Gibb Stuart Trust, to be a Partner Organisation for Islam Awareness Week in Glasgow. We’ve heard from Omar Shaikh about how Islamic banking works within the present financial system to create various Islamically-approved financial products – such as a loan to buy a house. What I want to do now is to take a step back to ask how that money is created in the first place, and to consider whether there is a way in which the matter of money creation itself can get as close to the Islamic principles, which we’ve been hearing about, as possible. One of the key concerns in Islamic finance is the charging of interest. Interest, of course, is charged on a debt. If money is not created as a debt – something to be paid back – then there can be no interest charged on it. Interest is prohibited and it is mentioned several times in the Holy Koran. For example, in Surah 2: 275, 276, 278, 279. Surah 3: 130. Surah 4: 161. Surah 30: 39. What I want to tell you this evening is that 97% of money circulating in society today is created at its point of origin as an interest-bearing debt. I want to suggest to you that this interest-bearing, debt-based system is one of the main reasons for house price inflation, financial bubbles and bursts, and recessions. And I want to describe for you a way that we can bring that percentage of interest-bearing money right down, and set our economy on a stable path. So, firstly, let’s examine money creation. There are two sources of money in society. There is the money which is created by the State, and there is the money which is created by the private banks – the High Street banks. The State creates the notes and coins. The Bank of England creates the notes, and the Royal Mint creates the coins. The way it works is that the Bank of England will get its printers to run off, say, 1 million pounds in £10 notes, and the private bank that wants that cash will buy that cash for £1 million pounds. The Bank of England will say, “Thank you very much,” and will take that money and give it to the Treasury. That is to say, the Bank of England will take that money and put it into the public purse, and that money will be used to do whatever the government of the day wants to do with it. That wasn’t always the case though, believe it or not. By 1844 the private banks were still creating their own bank notes – literally printing their own money. But a stop was put to that by Sir Robert Peel whose government brought in the Bank Charter Act of 1844 prohibiting banks from creating their own bank notes. That Act is still in place today and reserves the right to create bank notes, solely to the Bank of England. It also applies in Scotland. The Clydesdale, the Royal, and the Bank of Scotland, all purchase their notes from the Bank of England. It is simply that they are allowed to brand those notes with their own corporate design rather than use the Bank of England notes. Similarly buying coins from the Royal Mint works the same way. The bank purchases the coins at face value from the Royal Mint and that money is given to the Treasury. That’s notes and coins. However, notes and coins is only around 3% of all money circulating. Most money is not physical…it is digital. Around 97% of the total money supply today is digital. It exists simply as numbers in your electronic bank account which you move around from your account to someone else’s account via debit card, credit card, cheque book, and bank transfer. So, where does that money come from? Where does that 97% digital money come from? The law that made it illegal for banks to publish paper bank notes has never been updated to make it illegal for them to create digital money! The digital money is created by the High Street banks every time they make a loan, by the simple process of keying those numbers into your account. 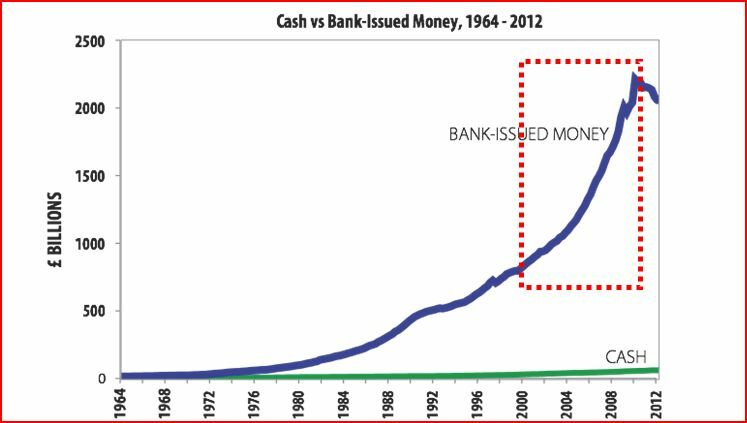 Have a look at this graph, which represents the amount of cash in the economy compared to the amount of digital money. All that money in the top line is private bank-created, debt-based, interest-bearing money. The relatively steady line along the bottom is cash. Now if we tried to create our own money we’d get a visit from the police. But banks can do it because their power to do this is not covered by the law. Banks are allowed to create this electronic money. That sounds remarkable you say. People think that banks are just taking from savers and lending to borrowers. They think it is the same money going in the front door and going out the back door. That is how it should work, ideally. But that is not how it does work. Rather, how it works is that the banks create the money they lend out of nothing. They are overwhelmingly the main increasers of the money supply, by lending money which they create out of nothing. 1. From an Islamic perspective, what this means is that most money in society, 97%, is created from its very beginning – at its root – begins life – as a debt upon which interest is being charged. 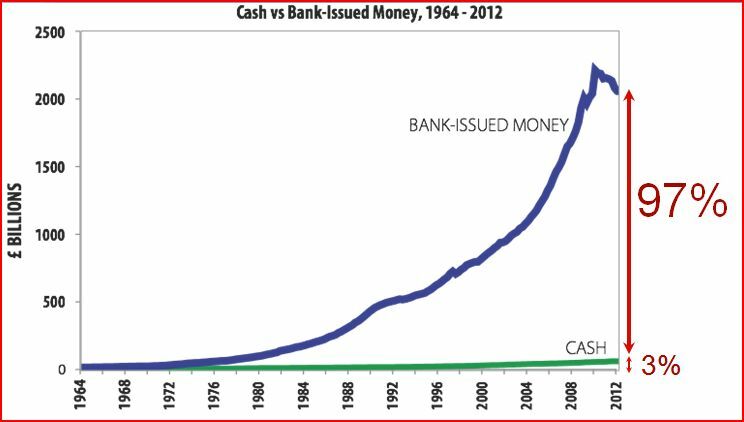 Let’s look back at this graph of bank-created money. In the last decade – which is the line within the box – the High Street banks have created over 1 trillion pounds of money. That is all interest-bearing money, created out of nothing. The area within that box is all non-Islamically created, non-Islamically approved money! And where is this money going? Overwhelmingly for the wrong things. Check out this illustration (below). 2. Most of this money is going into mortgages. (“Housing” in the graphic represents money going into mortgages, not construction.) Since the deregulation which began in the 1980s, it has been a lot easier to get a mortgage – which is not necessarily a good thing, when seen objectively, because all this does is push up house prices and rents. The reason why house prices and rents are so far above the reach of the average salary, is due very largely to the inflation of the house market through so much easy money as a result of the banks’ ability to create it out of nothing. 3. As we can see from this illustration, a lot of this money is also going into financial speculation, where big profits can be made. Only a small proportion is going to the useful economy which actually produces goods and services. So, from an ethical point of view, this concentration on making money out of nothing in order to make even more money, is questionable! As an aside, people wonder why profits and salaries are so high in the banking system. The answer is that when you can create your own raw material out of nothing, then profits will be very high. Imagine a baker who could produce flour out of nothing. Imagine a grocer who could produce vegetables out of nothing. Imagine the profits! Banks can create as much electronic money as they want, if they think they are going to get paid back. Of course, if they don’t get paid back then they have to account that as a loss. So there is a risk there. But all this money is simply conjured up out of nothing in the first place. We live in what Money Reformers term, a privately-created, debt-based money system, where our money is over-whelmingly created as a debt, and put into the economy in the form of loans, by the private banking sector. We are utterly dependent upon the High Street banks to supply the nation’s money. If they choose to turn off the tap, then no new money comes into society. If the banks have a crisis, and they stop making loans…then the nation’s money supply dries up. That is where we are today. The banks are not lending. They do not want to take the risk. They want to hoard any capital which they get, so they can mend their balance sheets. For us, it means less money is coming into society, and so there is a recession. Since the only way money comes into society is through bank lending, then, we often hear that the answer is to get the banks to start lending again? But what is that going to mean in reality? It will mean that more people are going to be encouraged to take out more debt, and it was too much debt, and people defaulting, that got us into this problem…in the first place! The fact is, in our society today, if we want more money then we have to borrow it from the banks. To have more money circulating it means we have to have more debt. More money means more debt. If we have less debt, which is a good thing for individuals and companies, and if people and companies are paying back their loans successfully, then the downside for the economy is that there will be less money circulating. If we want more money, we must have more debt. If we want less debt, we must have less money. 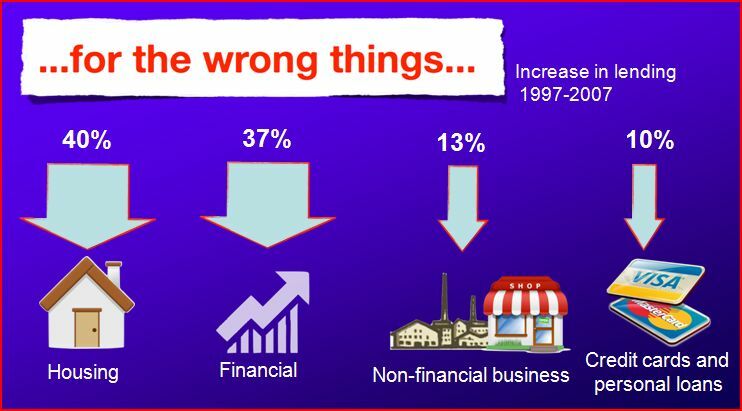 Yet to get out of a recession we need more money and less debt, but that is impossible under the present system! So, is there a way to get out of this Catch 22? Or should I say, “Cash 22”? Is there a way to have more money and less debt? Yes, there is. The way to do it is to switch from what we have, which is a privately-created, debt-based, interest-bearing money system, to a publicly-created, debt-free money system, where all money, at source, comes into society created by a democratically accountable public institution, not for profit, debt-free, and therefore also interest-free. And lest you think that this is some kind of “wouldn’t it be nice” bletheration…let me tell you that this is something that there are a lot of people entirely serious about making happen! The James Gibb Stuart Trust supports the work of Positive Money, which is a campaigning organisation promoting publicly-created, debt-free money. The Islamic Finance Council also works with them and back on 21 February 2013, the IFC hosted an Ethical Finance Round Table in the Scottish Parliament. One of the speakers was Ben Dyson from Positive Money. Now, I don’t speak for Positive Money, but I, and the James Gibb Stuart Trust, support what they’re doing. So let me just explain to you, briefly, the solution which they have very extensively mapped out. And this is do-able! It is not pie in the sky. It doesn’t require a revolution. It is a technical matter which can be brought in, relatively quickly, if there is the political will. And the good thing about it too, is that it is not a message of the left or of the right of politics. It is basically politically-neutral. Any and all parties, can, and should, adopt it as policy. Let me give you the quick version. Step 1. An Act of Parliament will ensure that High Street banks will be forbidden from creating money out of nothing. It shall be illegal. All money will be created by an agency of the State, a national institution which will be accountable to us democratically through Parliament. This money will be created “debt-free”. It will be created by an agency of the State, and spent into society by Parliament in the usual way…via spending in the public and private sectors. There will be no “debt” attached to that money. That is, there will be nothing to pay back. And so there is no interest attached. It will simply circulate in society… and it will eventually end up in our pockets. And we already have this draft Bill – the Bank of England (Creation of Currency) Bill – which explains how this can be done, and we have this book, Modernising Money, which expands on the Bill. Both are the culmination of a lot of careful research, consideration, feedback and effort. In short, this reform is ready to go and can be applied not only in the UK, but to every other country in the world which operates under the same system. We have the documents which explain fully how this is meant to work both in legal terms, and in plain English. Step 2. The High Street banks will compete to attract our money – the money which has been created at source, debt-free and non-interest bearing – into their investment accounts and will only lend the money they have acquired in that way. No longer will they be able to lend money which they have simply created out of nothing. No longer will they be able to inflate the economy, and especially house prices and rents, by simply creating loads of new money, in the way in which they have done to date. No longer will they be able to crash and burn the economy through the irresponsible creation of too much money. Now…under this reform…if you need a loan, you will still go to your bank, and yes, it will still lend you the money, and yes, it will still have interest attached – unless you bank Islamically – but the banks will no longer be able to just create this money out of nothing. They will only be able to lend out money which they actually have – the money which was created debt, and hence interest-free, at source…by the public authority. The banks will no longer be the money-creators in society. They will revert to simply being the intermediaries. From an Islamic concern about interest, what we can say for sure about this reform is that…while not abolishing the charging of interest per se…it would nevertheless abolish the charging of interest on privately-created money – because the ability of the private banks to create such money would be abolished. And that is a huge sum of money! Consider that graph with the box again. That 97% of debt-based, interest-bearing money is going to come right down to zero. The banks have created over 1 trillion of debt-based, interest-bearing money out of nothing in the last decade alone. This reform would abolish the charging of interest, over the years, on the equivalent of trillions of pounds. Let me leave the last word to Lord (Adair) Turner, who was considered to be in the running to become the Governor of the Bank of England this year. This reform would put a complete stop to the “private financial system’s” creation of money, and would thereby put the economy back onto a stable footing. I’m going to stop there. Thank you for listening.